But don't "worry", the insurance files are filled to the brinks and the game will "soon" come to a place where you will have to worry if justice will go grainual enough to reach you, "debunker". It's been almost half a year. How "soon" is "soon"? Should I start "worry"ing already? How granular (if that's what you mean) is justice going, and where can we see the results so far? Maybe it's too "soon". If so, I'll ask again in another half year. I think it's probably time to ask that question again. How about it, CE? Is "soon" getting any nearer? Is "grainual justice" (whatever that might be) heading our way? Just imagine the cultish mindset you must have to think that because people do not agree with your assessment, they therefore must be guilty of a crime. Consider if you think OJ really did kill (I do) his wife and her lover, and then people come along accusing you of being complicit in their murder. Astounding stuff there. The facts are in, like 9/11 truth "truther" being liars and believers in idiotic lies, the minority president t-rump is the liar in chief (lic). Chemtrails are a rare occasion of a "conspiracy theory" that can be investigated by everybody under NATO skies. 9/11 "truth" has not "died out", in fact your president is "a truther", who knows like everybody who paid attention that this truth is just too hard to swallow for the average propaganda victim, i.e. "the masses". I think I got it in 2008 when Alex Jones was leading his brown shirts shouting about the "New World Order" into NYC memorial. Lost cause as a prime focus. But don't "worry", the insurance files are filled to the brinks and the game will "soon" come to a place where you will have to worry if justice will go grainual enough to reach you, "debunker". He is certainly a liar, so why not!!!!! Should I start "worry"ing already? How granular (if that's what you mean) is justice going? Can you point me to the progress of justice in this field, please, so I can evaluate by myself if I should "worry"? I hope your rationalization batteries are fully charged, because this is going to deplete them. Trump looks like a fascist to me. Did I say "Trump is a WTC demolition theorist and here's the proof"? No. I asked if he signed one of AE911TRUTH's pamphlets. Damn. That's not what you asked or implied. I do hope CE replies, and gives us a definite date. You have no idea of the stress I've endured for the last year, worrying about when this day of reckoning is coming. A fact both facscinating and important. Thank you for sharing it. nah - he lacks commitment. 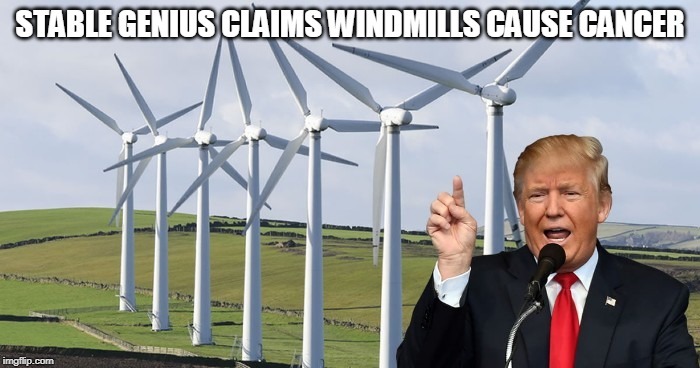 You mean windmill cancer nut? The liar in chief can't be a truther. Wait, truthers are liars, does that not make clownstick overqualified to be a truther.